Last month we were lucky to spend a weekend with other multi-bed acupuncturists like ourselves at the ACMAC conference. ACMAC (http://acmac.net/acu/) is a fantastic organisation that is both raising public awareness of this way of receiving acupuncture, as well as supporting all of us who are out there running affordable clinics. Multibed acupuncture is still pretty new and unusual in the UK, but has really taken off in the last couple of years, with loads of practitioners wanting to make acupuncture more accessible and affordable for everyone. There are now 66 clinics registered with ACMAC. If you know someone in another part of the country who you feel would benefit, they can use the ACMAC map (http://acmac.net/acu/clinics) to find their nearest clinic. ACMAC is a fantastic support for us. This is quite a different way of working than the one-to-one hour long sessions we are taught throughout our rigorous acupuncture training. To be able to provide treatments at the price we do we have to work with much tighter time constraints. ACMAC allows us to share knowledge and best-practice with others doing the same work, to learn new ways of ensuring we are giving you the best possible care and treatment within the multibed model. It was fabulous at the conference to meet like-minded people and learn from each other. 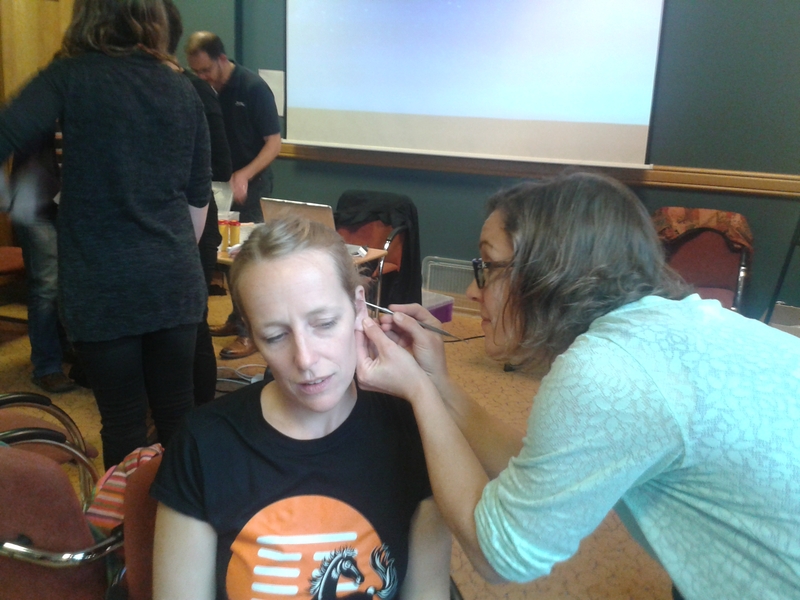 Here’s a photo of us at the conference learning great new auricular acupuncture techniques that we are already finding really useful in the clinic. This entry was posted in Uncategorized and tagged ACMAC, Acupuncture, affordable, Exeter, multibed by peoplesacupunctureproject. Bookmark the permalink.